LOCTITE® 518™ is a single component, medium strength, anaerobic sealant which cures when confined in the absence of air between close fitting metal surfaces. Typical applications include sealing close fitting joints between rigid metal faces and flanges. Provides resistance to low pressures immediately after assembly of flanges. Typically used as a form-in-place gasket on rigid flanged connections, e.g. gearbox and engine casings, etc. The thixotropic nature of LOCTITE® 518™ reduces the migration of liquid product after application to the substrate. 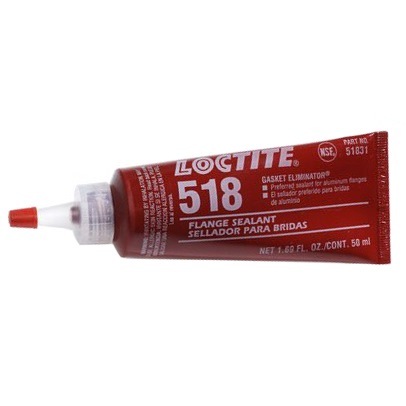 LOCTITE® 518™ provides robust curing performance. It not only works on active metals (e.g. mild steel) but also on passive substrates such as aluminum with a low copper content. The product offers gap performance to 0.25 mm (0.01 in) and contamination tolerance. It cures in the presence of minor surface contaminations from various oils, such as cutting, lubrication, anti-corrosion and protection fluids and cleaners containing surfactants and corrosion inhibitors.